Aneesoft 3D Flash Gallery offer you an easy way to make your first 3D photo gallery by choosing from variety of flash gallery templates. A flash gallery template automatically puts preset decoration to your gallery (layout, photo transition, background, font, text color). Each is uniquely designed to suits different website styles. 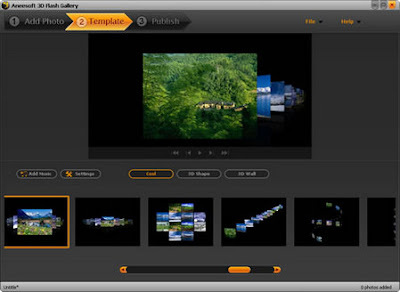 A 3D photo gallery created using a preset template can still further be enhanced by adding music and captions. · Three simple steps to create a 3D Flash Gallery. · photo editing (rotate, crop, add text, add special effects, etc.). · Add a title and link to photos. · Click and drag the thumbnail picture to put it in place or change the order of photos. · Organize all photos by name, size or date modified. · Choice of 40 templates + 3D. · Set the background color and background image for the flash gallery. · Set the time delay transfer photos. · Customize your own 3D gallery templates, setting the sequence of thumbnails and scroll actions. · Add multiple audio tracks as background music. · Add, remove, reorder tracks in the list of musical compositions. · Ability to trim music and add a Fade in / out effects. · Make Flash SWF files, so you can publish them on your site. · Flash gallery Send e-mail (flash gallery will be attached to an e-mail). · Create a file HTML.